From all of us a Berklee City Music, we wish you and your families a Happy Holiday Season and a Happy and Healthy New Year! This month’s Dean’s Set List video takes us to Puerto Rico and Harlem featuring Latin music performed by Erica Parra from the Boys & Girls Harbor, and Emilio Mendez and Gabriel Rivera from de Escuela De Bellas Artes De Carolina. All three students were City Music Summer Scholars this past summer when the episode was recorded. Erica Parra was senior in high school and received a full-tuition scholarship to Berklee College of Music from Berklee City Music, and Emilio, a junior in high school, received a $14,000 scholarship from Berklee College of Music. These three young talented musicians had never rehearsed together before, and made up everything on the spot. We hope you enjoy. GET YOUR TICKETS! Click here. Clinton Cerejo, a versatile multi-instrumentalist, vocalist, arranger, composer, and producer of more than 2,000 commercial jingles, who has been rocketing to stardom in India will bring his talents to Berklee as an artist-in-residence. His latest work is featured in Google India’s viral Google Search: Reunion advertisement, trending virally with its story of a reunion between Pakistani and Indian long-lost friends. 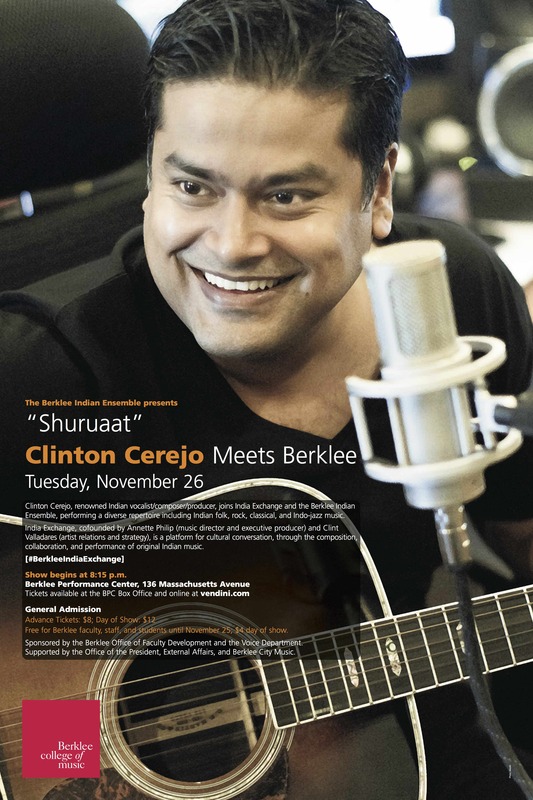 Highly sought in the booming Indian advertising and film industry for his signature Western-meets-Indian sound, Cerejo’s residency will culminate in Shuruaat – Clinton Cerejo Meets Berklee, a collaborative performance with the college’s Indian Ensemble on November 26, at 8:15 p.m. at the Berklee Performance Center. Shuruaat – Clinton Cerejo Meets Berklee will feature Quwali and Indian classical, rock, and jazz music from Cerejo’s expansive catalogue as well as original compositions by Berklee students. Performing together and separately, Cerejo and the Berklee Indian Ensemble—with musicians from 34-plus countries directed by Indian Berklee alumnus and faculty member Annette Philip ’09—will presentShuruaat (meaning “beginning”) in entirely Hindi, Urdu, Sindhi, and Tamil. Though the program serves as the culmination of Cerejo’s four-day residency, he and the Indian Ensemble rehearsed via Skype before his arrival in Boston. As an artist-in-resident, Cerejo will conduct workshops, master classes, and clinics with Berklee students as well as students from Berklee City Music, the college’s after-school music and college prep program for underserved 4th through 12th graders. During the clinics and master classes, Cerejo will focus specifically on the role that composers, singer-songwriters, and arrangers play in the music industry. He will also mentor student composers whose music will debut during the November 26 concert. Cerejo is a multitalented singer, composer, and producer in Bollywood who has carved a niche for himself assuming different roles in the music industry with his talent and style of music. His musical style draws from rich Indian classical and folk traditions fusing it with Western pop, rock, and jazz to create a sound that is uniquely his own. Cerejo is the voice behind several hit songs such as “Yaraam,” “Hey Ya!,” and “Kya Karoon,” as well as the composer for blockbuster films like Kahaani, Ek main aur Ek Tu, and Ek thi Dayaan. His hugely popular track “Madari,” composed for the MTV India series Coke Studio@MTV, soared in popularity reaching more than 1 million views on YouTube. Having worked closely with maverick filmmaker Vishal Bharadwaj, Cerejo is the music producer for the films Omkara, No Smoking, Kaminey, Ishqiya, Saat Khoon Maaf, Matru Ki Bijlee Ka Mandola, and the not-yet-released Dedh Ishqiya. Beyond Bollywood, Cerejo is the first Indian to arrange the vocals for Michael Bolton on an album featuring such artists as Seal, Rascal Flatts, and Chris Botti, as well as vocal arrangements for the Oscar-nominated song “If I Rise’ from the film 127 Hoursdirected by Danny Boyle. We are pleased to announce a new YouTube series called the Dean’s Set List. It features students from around the Berklee City Music Network performing in the office of our Dean, Dr. Krystal Banfield. In order for a student to be selected they must fulfill certain criteria pertaining to their academic standing, Berklee City Music standing, involvement in their community, and musicianship. It is a musical Dean’s List. 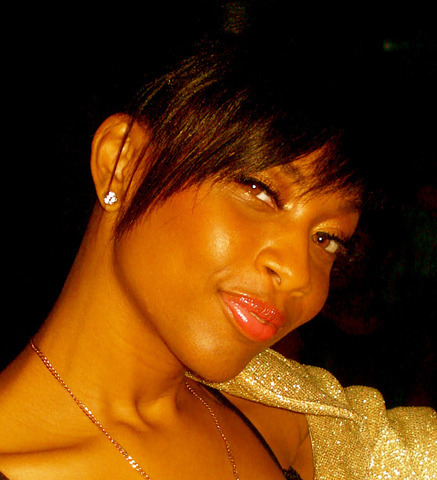 Our first video feature Corrine Savage from our Network site in Midland, PA, Lincoln Park Performing Arts Center. 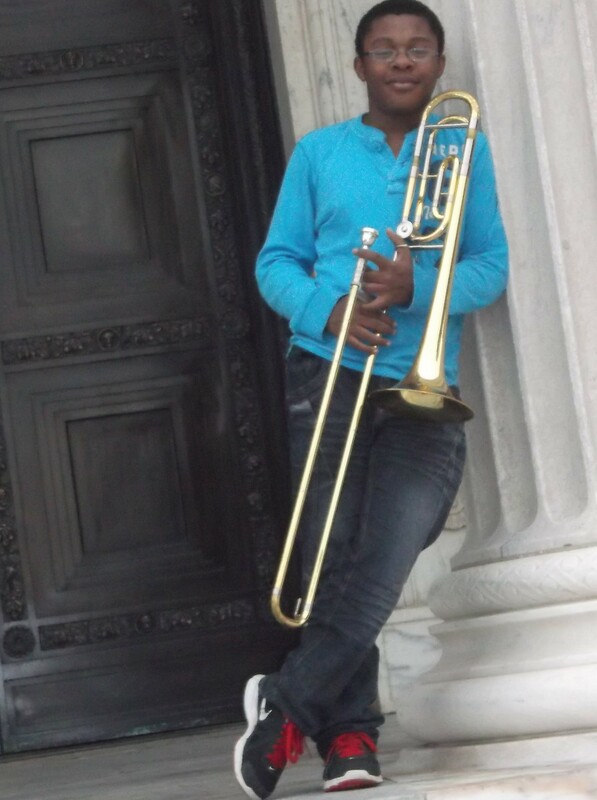 This past summer she was a City Music Summer Scholar attending the Berklee Five-Week Summer Performance Program. She was then awarded a full-tuition scholarship from Berklee City Music to attend Berklee College of Music and is currently a full-time student. Stay tuned as we will release a new video each month featuring different students from around the Network. The Berklee Encore Gala was featured in the November 9, 2013 issue of Billboard in the “Good Works” column. The Berklee Encore Gala benefits Berklee City Music to provide year-round music education and scholarships to Berklee’s Five-Week Summer Performance Program and full-time study at the Berklee College of Music. To view Berklee’s press release please click here. To view the article on Billboard please click here. To me, Berklee City Music is something that allows people from all over the country to come together and collectively embrace music. I love that in City Music I am surrounded by people with the same interests as me. Usually, in school, whenever I bring up a topic about music, everyone is very inattentive, but in City Music I can actively talk and share my music with other people who actually care to listen. City Music is also a place where you can learn about many things, whether it’s music, culture, or even getting to know somebody, you can always learn something new with Berklee City Music. What is it about music that makes you want to be a musician and pursue it as a career? I believe that music is something that is representative of the human soul. By that, I mean that music is able to define a person better than any combination of words. For example, if I asked someone who they loved listening to and they said Stravinsky; it probably means that they are boisterous, unique, creative, outgoing, and revolutionary. For me, music is the easiest way I am able to express myself. Sure I can tell someone something using words, but I believe it’s more heartfelt and meaningful if it is presented through music. This might sound cliché, but the person who has had the greatest influence on me is probably my mother. Any good mother should be an extremely strong, confident, determined, and compelling person. I believe that I gained these attributes from my mother because she had them and taught them to me. Since my mother is a preacher, I was raised in a somewhat religious and God fearing home. Through this, I was able to learn how to have faith. I believe that people who have faith tend to be more positive, therefore when a bad situation occurs they respond to it in a positive manner, making the situation less bad. Most of the time, my life is pretty much consumed by music and school work, but because I am part of the International Baccalaureate (IB) Diploma Programme, I am able to do many fun extra-curricular activities that aren’t necessarily music related. In the IB programme I am required to have at least 150 CAS (Creative, Action, Service) hours, although this can be difficult, I really enjoy doing this and trying to help out the community. Also, in the IB programme, I take the Theory of Knowledge (TOK) course, where we contemplate how we know what we know. Overall the IB programme is something that exposes me to many different things other than my main focus. Born and raised in Boston, MA, Harrell is no stranger to music excellence. She honed her crafts by attending the world-renowned Berklee College of Music and is inspired by legendary singer/songwriters Fred Hammond, Carly Simon, James Taylor, Babyface, Stevie Wonder, Billy Joel and Eric Clapton, to name a few. Obviously, her diverse influences have shaped her as an artist and songwriter. However, no one has had a greater influence on her than her own parents; both pastors and both musically gifted. To date, Harrell has worked with many industry greats including John Legend, Chris Brown, Mary J. Blige, Brandy, Mario, The Roots, Kelly Rowland, and producers Rodney “Darkchild” Jerkins, Claude Kelly, Harmony “H Money” Samuels, Benny Benassi, Alex Da Kid, The Underdogs and more. Certainly, the list will continue to grow. To hear from Courtney and other leaders in education, register for the Berklee City Music Network Conference in Memphis!